In THE BEGINNING, the legends united and ushered a new world, a transformation. As their might strengthened, THE AWAKENING became inevitable as the saga continued to unfold. Not long did this epic, transformed into something stronger: THE RISING of a new legend. But worlds fell apart as enmity consumed the myths. From a period of darkness, those who suffered and survived became stronger. They remain unfazed as they waited for the right time for a revolution. Now as the legends regain might, they rouse a once latent yet eminent force that would reopen the world. Their mounting sovereignty rejoices… And with a new found power now in their midst, a door opens for their REBIRTH. In this chapter, we immerse you further into the world of EXO with various activities everyone can enjoy. With the legends’ exodus to a new era, you definitely have to celebrate with old friends and even meet new ones by spazzing over your biases. Dance and sing along as our special guests entertain you with their rendition of EXO’s songs and performances. Show support to the teams who are ready to showcase their beastly moves in one explosive dance showdown! You can also expand your collection of EXO merchandise by purchasing from our concessionaires’ booths and enjoying the goodies and freebies that we have prepared just for you. We have treasures in store, so be sure to participate in the games and do your best to get hints and unlock the pathcode! The journey of the legends is far from over. We have conquered the maze of darkness. 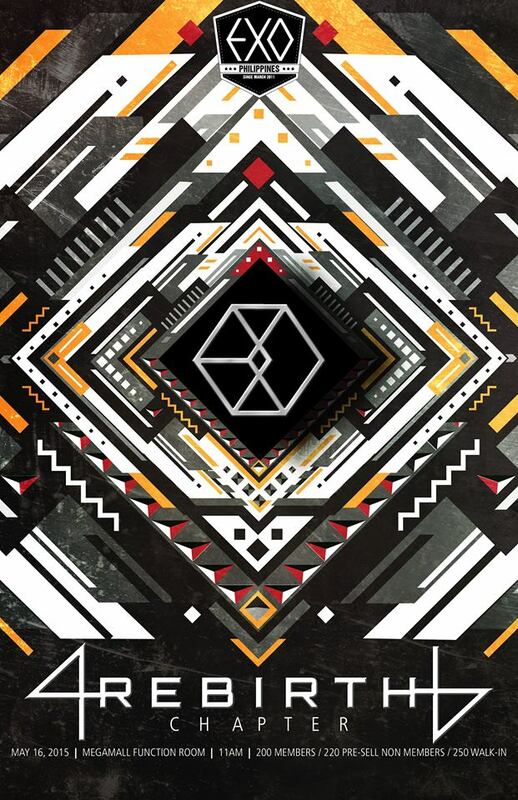 Join us as we experience the rebirth of EXO. 1. WILL TICKETS BE SOLD ON THE DAY ITSELF? Yes. But the price for walk-ins (people who will buy the tickets on the day itself) is different from the pre-selling price. Those who will buy tickets before the event will get them for PHP 220, while those who will choose to buy on the day itself will get the tickets for PHP 250. 2. WILL WALK-INS STILL GET FREEBIES? Depends. Freebies will come in limited quantities. That is the advantage of buying tickets early – you will not only get them in lower prices, but you’ll surely get freebies. 3. WILL THERE BE MERCHANDISE SOLD DURING THE EVENT? Yes, there will be concessionaires set up by your favourite online KPOP shops. We will release the list of concessionaires a few weeks before the event. 4. CAN I ATTEND THE EVENT ALONE? Of course! The purpose of the gathering is to ‘gather’ new friends. Who knows, you might even meet someone you’d eventually call your best friend. 5. DO WE HAVE TO BRING ANYTHING? EXO energy force that will last you a day of spazzing and pure fun! And perhaps some cash to get you all the EXO stuff you can get from our concessionaires! 6. WHAT CAN I EXPECT FROM THE EVENT? Cover group performances, dance battles, cosplay, official and unofficial merchandise, games, awesome prizes courtesy of our sponsors, meeting new people, meeting same people and most especially having FUN! 7. CAN WE BRING FOOD INSIDE THE VENUE? 8. WILL EXO BE THERE? Physically, no. But definitely In heart and in our mind, they will be! SEE YOU THERE! WE ARE ONE, WE ARE EXO!